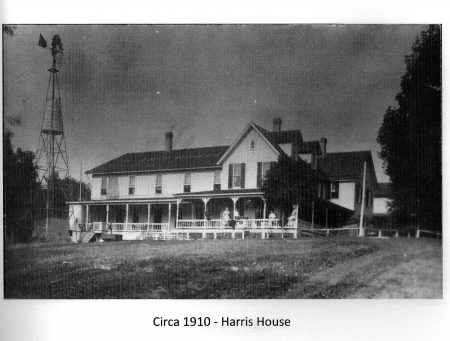 The Harris House was a popular hotel in Sodus Point run by the Harris family for many years. According to the Sodus Record, 11/12/1936, James Harris passed away at age 80 and is described as a “veteran Hotel-keeper and ardent angler”. 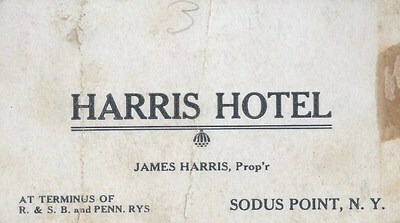 This same article further states, that in the spring or 1903, James Harris purchased the property where the Harris House, Sodus Point now stands and began the operation of a hotel on that site. He moved his family from Sodus to Sodus Point by trolley. Apparently, this was a busy place with many different groups, not only staying over in the rooms but also meeting and eating here over the years. Groups such as the Chamber, The Democratic party, Insurance people from Rochester and Syracuse, Railway people . Sometimes up to 100 guests were present to partake in a delicious chicken dinner. By 1933 , James’ son, Elliot Harris is living at and running the Hotel. In August of 1948, an ad in the Record states the “Point Inn” , formerly the Harris House is serving spaghetti dinners every Thursday night for $1.00 and other full course meals for $1.50 . It also has rooms for vacationists. This ran until at least 1952. “Don’t forget to visit the most popular hotel. 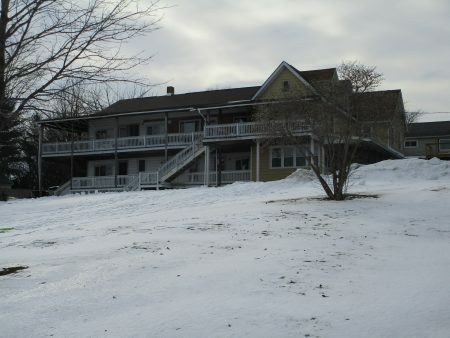 Sometime around 1948, it became the Point Inn and today it is an apartment building. It is located at 8440 Bay Street.